Greene County is the quintessential Down East county. It is sparsely populated, rural, agricultural, and racially polarized. In fact, Mitt Romney in 2012 received the support of nearly 90% of Greene County’s white voters, a statistic more typical of Mississippi than North Carolina. Greene is more racially conservative than other eastern counties because it lacks the moderating influence of any mid-sized city; the largest town, and the county seat, is Snow Hill, which has a population of just 1,595 as of 2010. Heavily reliant on tobacco, Greene County voters abandoned Democrats at the federal level during the Clinton administration. In recent years, the county has seen an influx of Hispanic residents; this group now composes 14% of the county’s population. Forecast: Originally a Democratic bastion, Greene was slow to move away from its ancestral party. Again, this can be explained by its rural character. The county even backed Michael Dukakis for President in 1988, and supported Bill Clinton in 1992. But because of the liberalism of Clinton’s first term and attacks on tobacco, white voters in Greene County swung heavily to the Republican Party and never looked back. The slight Democratic trend seen in recent years is entirely due to greater registration and turnout on the part of black voters in the county. Democrats are more competitive at the state level. Hagan won here in 2008, and Elaine Marshall came within 6 points of carrying it in 2010. The formula for winning Greene is to get blacks to turn out while peeling off just enough white voters. Obama certainly helped turn them out in 2012, but the second part of the equation proved more problematic, and in the end he barely cracked double-digits with white voters. The problem for Democrats is that often higher minority turnout will come at the expense of white support. Notably, Greene is only 51% white, but whites compose 59% of registered voters. The large number of unregistered Hispanics is an untapped resource for Democrats, but registering them and getting them to turn out is easier said than done. Right now 14% of Greene County residents are Hispanic, but they constitute only 3% of the voting population. The difficulty of organizing rural communities is one reason why Democrats continue to do poorly here. The black population is also growing at a much slower rate than the white population, typical of many rural North Carolina counties. Despite the Democrats’ problems at the federal level, they still hold the County Commission, and Hillary Clinton would probably stand a good shot at carrying the county in 2016. 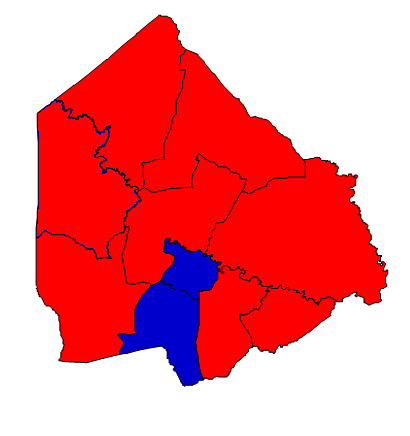 Notably, Greene County went for Hillary Clinton in the 2008 Democratic primaries, indicating crushing margins with white voters. The bottom line: eastern North Carolina is the ‘Deep South’ of the state, and Greene County is the ‘Deep South’ of eastern North Carolina. Fortunately for Democrats, white voters here aren’t typical of the state at large. And though Greene posted a healthy 12.59% growth rate in the 2000s decade, it still has a small population (21,362), hardly enough to wield much importance.